According to reports, the famous astrophysicist, Neil deGrasse Tyson, won’t be available to answer any questions during Monday's solar eclipsey. Tyson says he’ll be in an undisclosed location where he will experience this celestial phenomenon in private. 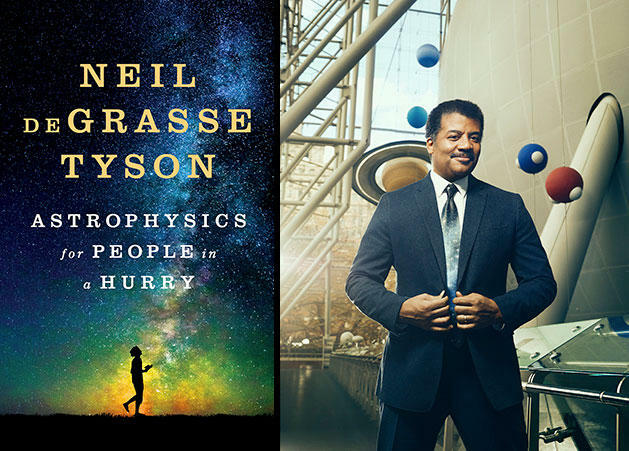 But Tyson did share his ideas about the cosmos and the people who have studied it, in his latest book, “Astrophysics For People In A Hurry.” Book critic Joan Baum has this review: Neil de Grasse Tyson knows he’s a science rock star and loves it. Just look at that photo of him on the back flap of his newest book, Astrophysics for People in a Hurry. He’s smiling, standing in mock swagger mode before an astronomy display, his favorite planet Saturn in view. And he’s delighted to trot out the fact that he’s had an asteroid named for him, and that as far as he knows, his guy’s not heading toward Earth to do any damage. Neil’s not just content, however, with trying to explain difficult concepts about the cosmos, such as dark matter, “the longest -standing unsolved mystery in astrophysics.” He also wants to tease us into being “hungry” for science. And may we call him “Neil” since he often calls his favorite scientist “Al”? Though his admiration remains the highest for the theorist of the general theory of relativity, Neil does playfully say that “for the most mind-warping ideas of 20th century physics, just blame Einstein.” But Neil also talks about scientists most of us haven’t heard of, such as Fritz Swicky, who in the 1930s analyzed dark matter, and Vera Rubin, who in 1976 showed that the stars farthest from the center of their spiral galaxies orbit at the highest speeds. And who knew about “exoplanets” – those celestial bodies that orbit around a star that is not the sun? They were first detected in 1995 and so far, scientists have identified over 3,000. As for Pluto no longer being a planet, Neil’s advice is simple, “Get over it.” For all its ease of style, however, “Astrophysics For People In A Hurry,” isn’t that easy to digest especially for people in a hurry. Go slow. Re-read. Reflect. The author, who is the director of the Hayden Planetarium and the host of award-winning science programs, is a man on a mission, particularly evident in the eloquent last chapter of the book, “Reflections on the Cosmic Perspective.” “Dare we admit, he begins, “that our thoughts and behaviors spring from a belief that the world revolves around us? Apparently not. Yet evidence abounds.” In other words, Neil is saying that many people, including some with influence and power, won’t admit that human beings are not the center of the universe. Driven by “inflated ego,” a misreading of nature and a fear of seeming small and insignificant as a species some may not even see that we all are “participants in a great cosmic chain of being.” That differences of race, ethnicity, religion and culture, which as Neil said, “Led our ancestors to slaughter one another,” are part of a “direct genetic link across species both living and extinct, extending back four billion years to the earliest single-celled organisms on earth.” And the science deniers don’t celebrate as they should, Neil says, being part of an evolving universe of interrelated forces and matter, a humbling perspective that might make them more curious and caring about the planet we all share. Joan Baum is a book critic who lives in Springs Long Island.